Demand forecasting is closely related to the adoption of innovations within a target population. Looking back on the still recent dot.com bubble crash, one major mistake made by all of us was timing: we have often misjudged the speed of adoption of new, but often immature technologies and applications, and placed huge investment bets on the start-ups that developed them. In order to avoid repeating the same mistakes in the future, we need to base our investment decision on better prediction models. Prediction tools must improve, and diffusion models can provide the starting point. Everett M. Rogers, who wrote “Diffusion of Innovations” more than 40 years ago, has provided us with a powerful framework. Rogers has extensively investigated since the 1950s how innovations diffuse in society, and has introduced the notion of S-curve, an S-shaped curve that shows how usage of an innovation evolves in a population over time. His famous S-curve can be broken down in five distinct user segments and phases, also described particularly well by Geoffrey Moore in “Crossing the chasm”. Innovators are the first to adopt new products and services. They are technology freaks par excellence, and like experimenting and playing around to find out what they can do with their new toys. Innovators typically represent a few percent of the target user base. Early adopters also invest early on in new technologies, not as technologists, but to address their concrete problems. They typically represent about 10% of the target population. In companies, early adopters are opinion influencers. Often they will not be decision makers themselves, but are key to convince others. Early adopters are usually at the centre of extensive communication networks, for instance internal management circles, industry fora, or are very sociable individuals in their private sphere. When a critical mass of early adopters has developed, the process of technology diffusion becomes self-sustaining and like a snow-ball effect, it spills over to the early majority. On the other hand, competing and incompatible standards slow down the rate of adoption and the transition from early adopters to the early majority. The early majority is happy to wait and see until a main stream of users and technical standards have materialised under the influence of the early adopters. Only then are they ready to invest in innovation to satisfy concrete needs. They typically represent 40% of the target market. In corporate life, these are decision makers who need to be convinced by references before they allocate budget. The early adopters and early majority usually have higher socioeconomic status than later adopters. Being financially better-off than late adopters, buying pricey technology early is less risky to them. Studies have also shown that the early adoption of innovation tends to strengthen their economic position and widen the gaps between the higher and lower individual in a system. Paradoxically, the individuals who adopt first generally need the benefits of the innovation comparatively less than later adopters. The late majority has similar characteristics and expectation as the early majority, except that they are risk averse and uncertain about their ability to master innovation. As a consequence, they prefer to wait until products have been further developed and designed for the mass market, and provide an increased level of user-friendliness compared to previous generations. The late majority is made of followers and represents 30%-40% of the target market. Laggards are technology averse and resistant to change. If they buy technology at all it is because the technology has become so pervasive that they have little choice not to use it. As a market, they are usually of limited interest to technology sellers as they require low price, a lot of support and their profitability is the lowest. Laggards amount to about 10% of a total market. Note that some innovations stagnate in the early adopter market and fail to reach critical mass to develop to the following stages. The transition from the early adopters to the early majority can be particularly challenging, as described by Moore in “Crossing the Chasm”. As marketers the best approach is to look at the five categories of adopters as different target segments to be addressed sequentially, usually with different products, communication messages and sales channels to meet the specific needs of each segment. The self-sustaining pattern of growth in the early majority phase has been extensively documented in innovation diffusion, and attempts have been made to model the effect. 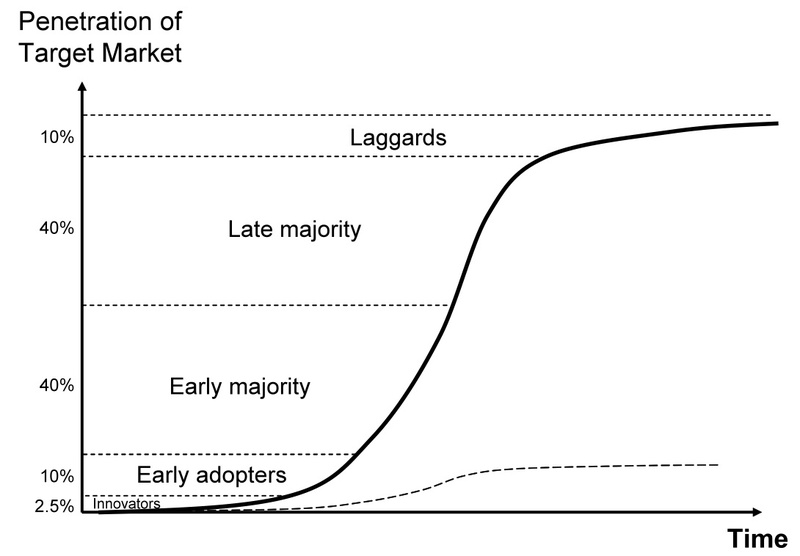 For example the Bass diffusion model has specific factors for early adopters and imitators (early majority) in a market – see the S-Curve page.